Mike Girone reports: "I was watching the American Avocet from the east-facing promenade on Marsh Discovery Trail late [Saturday] afternoon, when it took off with a small flock of sandpipers around 3:55 p.m.
"The avocet landed in deeper water about halfway between the promenade and the eastern end of the shorebird pool, while the sandpipers continued past Transco Trail. "Shortly afterward, a juvenile Peregrine Falcon appeared from the tops of the Phragmites near the small bird blind, dropped to within a foot or 2 of the water and went straight for the Avocet. 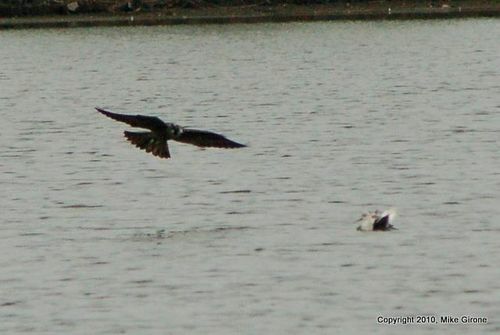 The Avocet ducked under the water as the falcon passed within inches of it. 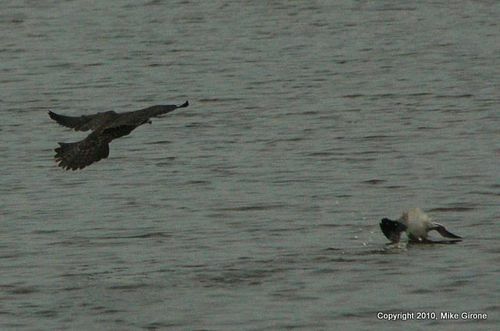 The Peregrine buzzed it several more times, but the Avocet stayed in the water, and just kept ducking the falcon's talons as it drifted east. The Peregrine broke off after a few minutes and headed west along Transco Trail. "What was likely the same Peregrine was spotted again about a half hour later around the entrance to Marsh Discovery Trail attacking (unsuccessfully) sandpipers in the western edge of the pool, across from the guard gate. I didn't get a good enough look at its legs to see if it was banded. For an earlier post (20 months ago) on a Peregrine strafing a Snowy Owl near DeKorte, click here.